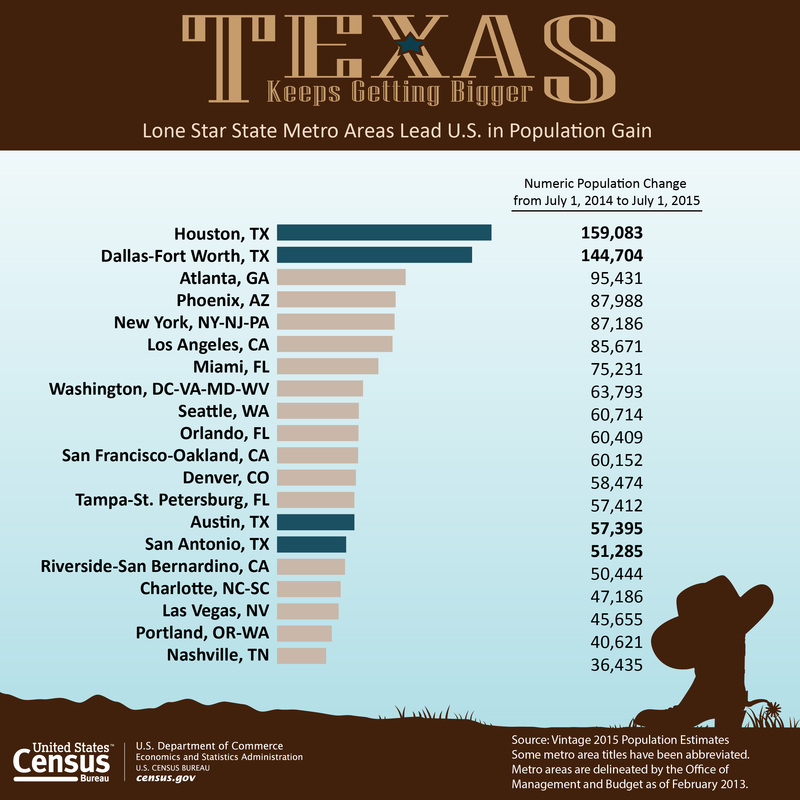 The collapse of the oil boom has not slowed down Texas’ rapid population growth. The Houston area added more people last year than any metropolitan region in the country, continuing its exceptional growth of the last decade and a half, according to new U.S. Census Bureau data released Thursday. Combined, the greater Houston metropolitan area, which includes Houston, The Woodlands and Sugar Land, grew by about 160,000 people between July 2014 and July 2015. Even in a year when the region was rocked by falling oil prices, the population gain was still bigger than the two previous years, when the boom appeared never-ending. As a whole, the so-called Texas Triangle of Houston, Austin/San Antonio, and Dallas-Fort Worthadded more people last year than any other state in the country, growing by more than 400,000 residents, or roughly the population of Minneapolis. Harris County alone added nearly 90,500 residents. “Our growth has been so exceptional that we are out-competing” the rest of the nation, said Steve Murdock, a former Census Bureau director who heads the Hobby Center for the Study of Texas at Rice University. Not only has the region grown more in absolute numbers than the rest of the country – it is also growing at a faster rate. Of the country’s 20 fastest-growing counties, eight were in Texas, including Fort Bend County, which added nearly 29,500 people last year and expanded by more than 4 percent. Of the nation’s 20 fastest-growing metro areas, Houston is by far the biggest city on the list, with growth of 2.4 percent. The reason people keep flocking here: Jobs, lots of them, and a cheap cost of living. But even within the period measured by the Census – which started at the beginning of oil’s decline and ended before prices bottomed out last month – there were signs that growth was slowing, though just slightly. Oil prices peaked in June 2014 at about $105 a barrel and have tumbled more than 50 percent since. “We’re starting to feel the impact,” said Patrick Jankowski, senior vice president of research for the Greater Houston Partnership, an economic development organization. He said the Houston metro area created 57,300 jobs during the period tracked by the Census, compared with 97,500 new jobs the year before. About 22,000 new jobs are forecast for this year, a significant drop. Although the number of people moving to Harris County from other cities and states had been surging upward for years, it dropped by 20 percent in the period covered by the Census. The greater metro area saw a more gradual decline of 6 percent, to about 62,000. Still, he noted that the Houston region has added nearly 737,000 people since the 2010 census – growth of about 12 percent – while many other cities like Chicago are losing residents en masse. The slight cooling “gives us a chance to catch our breath,” he added. The Houston area also has a fair amount of growth from natural causes, which is to say more people being born than people dying. It will be interesting to see what these numbers look like in another two years, especially if oil and gas prices remain low. I don’t expect the area to lose population, but there’s a lot of room still for its growth to decelerate. There’s a map embedded in the story that shows the growth of each county. Every major metro area, including places like Tyler (Smith County), San Angelo (Tom Green County), and Abilene (Taylor and Jones counties) grew. The one sort-of exception was Amarillo, which is split between Randall (grew by 1,575) and Potter (lost 474) counties. Some grew more than others – El Paso, which has 835,593 people, only added 48 more. The only counties of any size I could find that didn’t grow were Coryell (population 75,503; lost 4 people) and Wichita (population 131,705; lost 1,250). Wichita, home of Wichita Falls, was the only county in Texas to lose more than 1,000 people. And if you’ve ever wondered why traffic on I-35 is as bad as it is, every county along I-35 from Bexar to Bell grew by at least 5,000 people. So there you have it. The official Census Bureau press release is here, and Texas Monthly, Reuters, Bloomberg, CultureMap, the DMN, and the Trib have more. To hear some of the extreme right wingers out there, people are fleeing Houston in droves over the possibility of minor tax increases though those are also the people claiming the city is bankrupt when Moody’s and others rate the city’s debt at the fourth highest level possible. While I wait anxiously to see the specific numbers of increase from the Census Bureau and the full proposal for Mayor Turner’s upcoming budget next month, this sure seems to deflate the sails of the crazies out there.